In a Wednesday night in-state rivalry at Lakefront Arena, the Privateers started fast, but UL Lafayette finished strong and won a 77-73 overtime decision. The New Orleans defense rattled the Ragin' Cajuns early, creating a frenetic pace and turning over the visitors 14 times in the first half. Through the first 16 minutes, UNO led 29-15, with 16 of those points coming off turnovers. But ULL was able to gather themselves, scored the last 11 points of the half, and make it largely a halfcourt game the rest of the way, gradually wearing down the Privateers until they finally took the lead late in the contest. The Cajuns only turned the ball over five times over the final 29 minutes of action, and New Orleans' offense struggled in halfcourt sets. Gerrale Gates, though, tied it at 59 with a jumper with 13 seconds left to send the game to overtime. 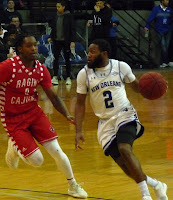 Gates scored seven points in overtime to keep the Privateers in it, but the Cajuns were ultimately too much. Gates, a freshman, led the way for UNO with a career-high 17, and Damion Rosser added 13. New Orleans' best shooters, Bryson Robinson and Ezekiel Charles, combined to shoot 5-for-24 and 2-for-10 from deep. As a team, the Bucs shot an anemic 35%. The balanced Cajuns attack featured three players with 12 points and another two with 10. After a week off, UNO will face another former Sun Belt rival when they take on South Alabama at Lakefront Arena next Wednesday.